Springs for The Source, Steps to The Summit: Must We Bring Back the Magic of the Medieval Mass? 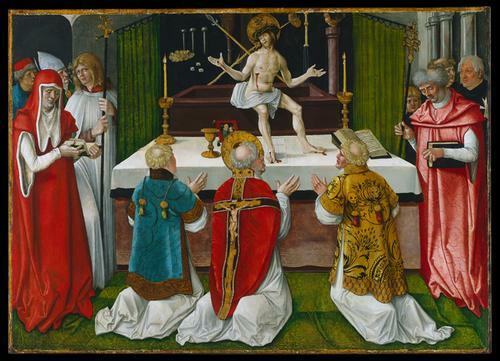 Must We Bring Back the Magic of the Medieval Mass? Churchgoers today complain of a palpable loss of the “sense of the sacred.” In their efforts to purify the rites of medieval accretions and superstitions, did the reformers who implemented the liturgical vision of the Second Vatican Council drive out the Holy Spirit from the liturgy? Pope Benedict XVI, through his Motu Proprio Summorum Pontificum, attempted, among other reasons, to address this problem by extending the use of the Tridentine Mass. Will this return to the pre-conciliar liturgy really solve the problem? The Tridentine Liturgy traces its development to the fusion of the Roman liturgy with Franco-Germanic culture in the 8th century. Pepin the Short (751-768) and his son Charlemagne after him (774-814), desiring to reinforce political unity through liturgical uniformity, sought to impose the Roman rite throughout the empire. But when Charlemagne received, as he requested, a pure (immixtum) copy of the Sacramentary being used in Rome from Pope Hadrian I, he was disappointed to find out that it did not contain the desired formularies for funerals, blessings, and devotions very popular among his Gallican subjects. The Roman way of celebrating liturgy did not exactly correspond to the culture where it was being transposed. Romanitas, characterized by austere sobriety, simplicity and functionality, contrasted starkly with Franco-Germanic culture which was profusely sentimental, melodramatic, and elaborate. He then commissioned Benedict of Aniane (+821) to prepare a supplement and henceforth, Gallican customs would merge with the original Roman liturgy. In a desire to guarantee these effects, great emphasis was accordingly given to the precise execution of the rites. The words of consecration, in Latin, were especially thought to possess magical powers and there were even attempts to borrow them (hocus pocus) for occult use. Participation of the laity also decreased dramatically during this period, giving way to the priest, who alone was believed to possess the power to “confect” the Eucharist, which he received through the anointing of hands at ordination. In their desire to appropriate the “fruits” of the Mass for themselves and their loved ones, including the deceased, lay people would offer stipends to have numerous Masses said for them. Some went as far as building private chapels and endowing numerous benefices for priests to continue having Masses said for them even after death. Furthermore, this liturgical mindset would result in other curious liturgical practices such as private Masses, the Missa quadrifaciata, “altarist” priests like those of Cluny, Gregorian masses for the dead, privileged altars and others. Meanwhile in Rome, increasing decadence invaded ecclesial life as Popes became more and more preoccupied with the temporal administration of the Papal States, global politics, and the highly secular lifestyle that went with it. John XII, perhaps the worst of these Popes, was accused by his own clergy of simoniacal ordinations—including that of a mere ten year-old boy, of gifting prostitutes with sacred vessels and of making the Lateran basilica and its adjoining palace “a brothel” rather than a temple. These accusations were highly emblematic of his mundane inclinations, which led to the neglect of the liturgy. Otto I (951-973) discovered this when he went to Rome to be crowned emperor of the Holy Roman Empire in 962. Hence, in the following year, he brought with him to Rome a team of archbishops and bishops to promote liturgical reform among other reforms in line with his overall agenda of Renovatio Imperii. As part of their political strategy, the Ottonians also lodged Germans into the Petrine See from 1046-1057: Clement II, Damasus II, Leo IX, Victor II and Stephen IX. These Popes celebrated the liturgy according to the Gallican form, which they knew. With the absence of scriptoria in Rome to produce its own liturgical books, Gregory V (996-999) commissioned the Cluniac monks of Reichenau to regularly furnish him liturgical books in exchange for ecclesiastical immunity. Thus, the Franco-Germanic liturgy found its way back home with all its trappings and became standard Roman usage. Sporadically, there were efforts in Rome to return to their original way of celebrating the liturgy and to purify it from Franco-Germanic influences. In the 11th century, Gregory VII, who was Roman by birth, called for the simplification of the rites in accordance with the regula sanctorum patrum. His initiative was carried on by liturgists and their success is reflected in the Roman Pontifical of the 12th century, where flourishes such as secondary rites that were primarily didactic as well as elements offensive to Roman sensibility including the Mass for energumens and the blessing of torture instruments were excluded. But further than this, the Franco-Germanic influence proved very hard to shake off and it would spread even further with the publication of the Missale Curiae during the time of Pope Innocent III. Originally, the Missal was intended as a portable liturgical book that came with a similar Pontifical and Breviary, for the members of the Roman Curia, who functioned as an itinerant administrative body. The newly founded Order of Franciscans however, who were close to Roman Curia, requested to adopt it also and soon spread it in effect along their missionary routes. The inculturated Franco-Germanic liturgy, as contained in these Missals, thus extended further around the world—and not without its superfluous accretions and accompanying superstitions. These abuses would help launch the Reformation. Thus, the liturgical agenda of the Council of Trent (16th century) was actually to get rid of this undesired clutter and recover the pristina sanctorum patrum norma in line with the previous attempt of Pope Gregory VII. However, the lack of ancient liturgical manuscripts would only allow the reformers to return to sources no earlier than the fifth century. Hence, its success was very limited although not insubstantial: among others, the magical treatment of the consecrated host was eliminated, stipends and private Masses were regulated, and some superstitious practices such as fixed Masses were abolished. Nevertheless, it was the Council’s universal imposition of liturgical uniformity that would possess the greatest impact. It would prove lapidary in the solidification of this way of doing liturgy, which, despite the various attempts to reform it, by and large remained medieval in ethos. The Second Vatican Council, thanks to the recovery of ancient liturgical sources, would succeed more than any of its predecessors in recovering the ancient Roman liturgy. Yet by this time, the Mass of Trent had already acquired an air of tradition and universality, reflected in the continuing polemic which subtly labels the post-conciliar Order of Mass as “Novus Ordo” despite its basis on more ancient tradition, as opposed to what they call the “Mass of the Ages” or simply, the “Traditional Mass.” In fact, some groups like the Lefebvrists would go as far as rejecting the liturgy of the Council and denying its validity, thereby separating themselves from the mainstream Church. Pope John Paul II thus allowed the celebration of the Tridentine Mass on a limited basis in 1984 while Pope Benedict XVI finally liberalized its use, albeit calling it the “extraordinary form” of the Roman Rite in 2007. More and more people, especially in Europe and the United States, are availing of this license from Summorum Pontificum in their longing for the “sense of the sacred.” Even here in the Philippines, we have begun to see, although still on a limited basis, the return of the Tridentine Mass as well as “Neo-Tridentinisms” even in the celebration of the reformed rites such as the revival of ad orientem, the reemphasis on surviving apologiae and the use of Latin in liturgy. So the question we have is truly urgent: “Will this movement really address our hunger for the presence of God?” Our brief historical survey offers some considerations. The Mass of the Council of Trent is not after all the “Mass of the Ages,” as if it has always been so even in the time of Christ as some artistic representations from that period suggest, but is the product of historical evolution. Further on, this historical project, as we have seen, failed essentially in its express and consistent objective of promoting the pure Roman liturgy, resulting instead in its accidental fusion with Franco-Germanic culture. And while Gallican culture and its spirituality lent its inherent “sense of the sacred” to the originally sober and simple Roman liturgy through its elaborate and evocative rituals, we also realize that this medieval magic can actually lead not only to mysticism but also to superstition. Furthermore, we notice here that the artificial transposition of liturgical practice to a different culture usually results in serious misalignment. The Carolingian attempt to impose romanitas in Gaul, for the extrinsic agenda of political expediency did not work as planned. Instead, it backfired and resulted in the loss of romanitas even in the liturgy of Rome itself until its final recovery by the Second Vatican Council. We seriously wonder then whether the return of the Tridentine Mass to our modern liturgical assemblies would really bring to us that “sense of the sacred” deeply connatural with the medieval ethos yet so patently absent not only in our liturgies today but also in our society at large. Or would it backfire in the long run? Bokenkotter, Thomas. A Concise History of the Catholic Church. Doubleday Publishing, New York. (1990). Chupungco, Anscar, OSB, ed. Handbook for Liturgical Studies Vol. I: Introduction to the Liturgy. Liturgical Press, Collegeville. (1997). Kocik, Thomas. The Reform of the Reform?. Ignatius Press, San Francisco. (2003). J. Jungmann. The Mass of the Roman Rite: Its Origins and Development. (Dublin 1986) I: 129, note 10. quoted by Keith Pecklers, SJ in his article “History of the Roman Liturgy from the Sixteenth until the Twentieth Centuries” in A. Chupungco, OSB. Handbook for Liturgical Studies. (Collegeville, 1997) p. 154. With all due respect, the commonly held misnomer that the Novus Ordo is somehow closer to the tradition of antiquity is purely and simply a fallacy. Yes, there may be some elements of an older tradition that have been re-instated in the Novus Ordo Missae. However, there are also a certain number of liturgical innovations that constitute a definite rupture with the perennial Tradition of the Roman Rite. Whether these innovations are better for the people of today or not is debatable. In passing, I would also like to add that it is almost impossible to find a single parish in most dioceses where the Novus Ordo is celebrated in full accordance with the rubrics of the Missal and in fidelity to what Vatican II's Constitution on the Sacred Liturgy actually said. Those who are for the Traditional Liturgy simply are fed up with the last 40 years of liturgical chaos that have reigned almost universally in the Church. 0822jejeasics gel lyte v volcano homme Nike Max Air chaussure nike homme blanche Traditionnel BW Brun foncé Les techniques de la jambe blanchie sont certaines de vous permettre d'être ajouté buty nike air max 90 current moire à la mode dans l'œil des autres! Ces types de chaussures avec nike air jordan 1 retro mid lakers edition le design spécifique semblent incroyablement reconnus par d'autres personnes! Humour indiqué le collier de asics france lattes formation épais rembourré réel ainsi que la langue. Le défi consistera à cortez nike noir s'appuyer sur les perspectives Internet qui ne tiennent pas compte du modèle basket nike air max homme 2017 noir et aussi pour aider les acheteurs existants. Arthritic lombalgie et les douleurs nike air jordan 1 retro high og clover celtics pride aux pieds sont parmi la liste des problèmes les plus courants que le public américain air jordan basket prix souffre aujourd'hui. Is the New Mass just a gig?